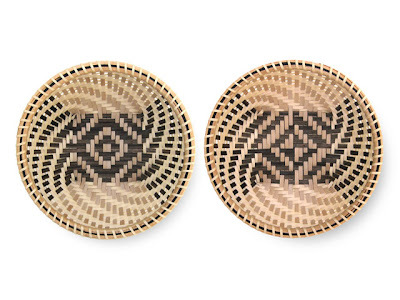 These charming twilled bowls are woven of natural and stained black ash splint. 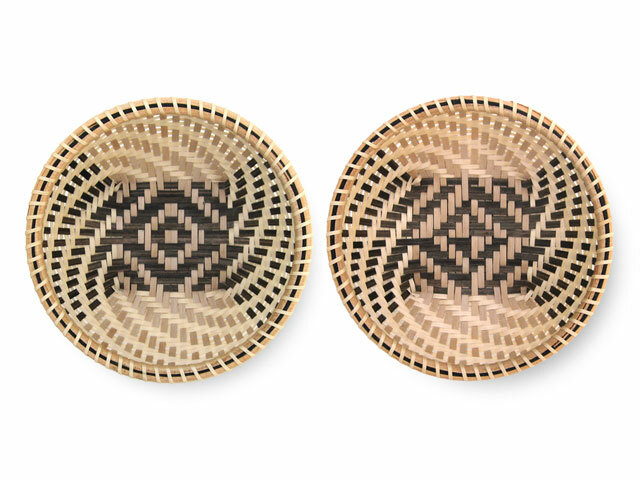 They feature a diamond design in the base, twilled sides, black waxed linen rim filler and lashed hardwood rims. These baskets were inspired by an antique Shaker basket found in the Fruitlands Museum in Harvard, MA. Although smaller than the original, they contain the same classic design elements: the quadrafoil twill design and captured lid. 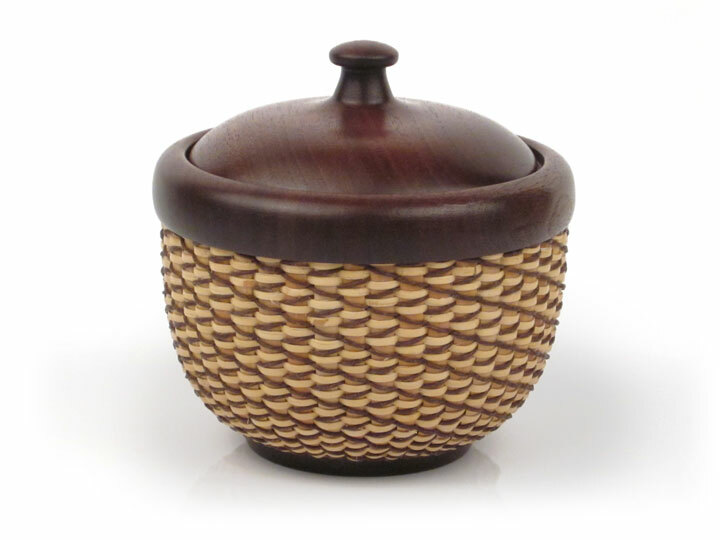 They are woven of finely prepared black ash over two different molds and finished with hardwood rims. either the 6" Lidded Cathead or 4" Cherub. This is another basket kit I purchased from Marlys Sowers. It features a walnut base, solid rim and turned lid. 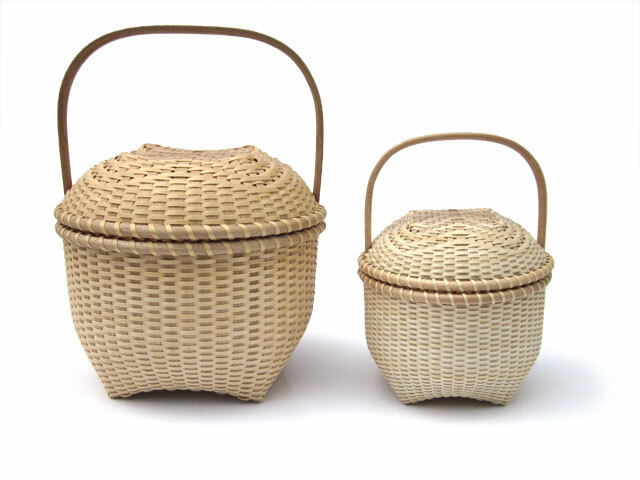 The basket is woven of cane over cane (the kit included half-round reed uprights, but I substituted my own 5mm cane) with waxed linen. It was a fun basket pattern to weave. You are actually weaving with two different elements at the same time, a strand of cane and a length of brown waxed linen. It took a few minutes to get the pattern down, but once I got into the rhythm it was easy and fun to weave. I would really like to try this pattern again on another basket. I bought the Marlys Sowers kit for this basket at the Stateline Weaving Retreat and finished it right after I got home. It features a zebra wood base, single-piece rim and lid; and dyed hamburg cane and flat oval reed. 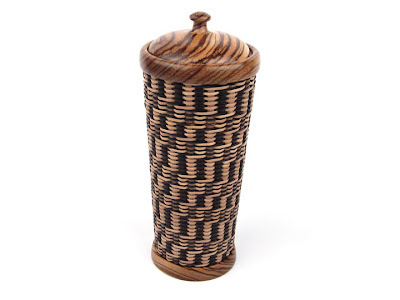 The basket is woven over a plastic tumbler which is glued to the base, so it is not only the mold, but also a liner for the vase. While the pattern looks complicated it is actually quite easy and fun to watch form.